Learn to Love your toilet bucket. Fellow river enthusiasts and steelhead fanatics, please use it. Be Your Own First Responder. We only found a single smoldering hot spot which we doused. Having a shovel, a rake and something to carry water can help you take action if you need to. BYOS. Bring Your Own Shade. It is time to invest in some portable shade. Even if you find a decent camp with a few lingering alders, these trees deserve a break from providing shade duty for our river camps. The soils almost everywhere are dry and dusty so our use is going to naturally concentrate around the few remaining green and shaded areas. The trees that did survive could be compromised very quickly from soil compaction in your favorite camps. Tread lightly. Watch Out for those Burned Trees. Beware of the trees that burned but are still standing. When the winds come up, it is possible these blackened sentinels of the past will crash in your camps at all of the wrong times. This could also happen when you are fishing your favorite run so be aware. An upside for birds, bugs and fish. There will be increasing amounts of larger wood in the river as the burnt trees fall or are blown over on the banks or in the river. Downside. They will be hell to wade around at times and we will all lose more flies (so keep tying or buying everyone!). Burnt Stream Banks. Chances are that the charred black hummocks could become the first places for vegetative recovery. Treat them nicely and tread lightly. Afternoon water temps. Until PGE begins releasing bottom-draw water from Round Butte Dam, the afternoon water temperatures in the Deschutes below Sherars Falls will be too warm to fish after about Noon to 1 PM. The morning temperatures are barely dropping below 66F. The evening water temperatures are topping out at 71F. If you hook a steelhead, it will be fighting for its life in water that does not have enough oxygen to let that fish recover once you release it. Voluntarily STOP fishing at Noon or 1 PM until you can confirm that the water is cooler than 66F. Minimum flows. The minimum water releases from the Pelton Re-Regulating Dam are supposed to be no less than 3800 cubic feet per second (CFS). Pelton is releasing 3860. The flow at the USGS gauge just above Moody Rapids shows stream flow at 4130. 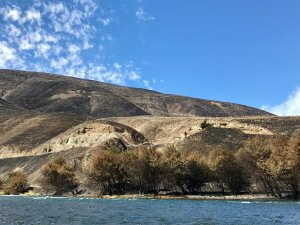 That means that there is barely any added streamflow is being added through streams like Trout Creek, Warm Springs River, White River or groundwater springs, while irrigation and municipal uses along the river are withdrawing their share of the natural flow. When the streamflow is low, it invariably affects the water table which in turn affects the soil moisture and moisture level in roots, trunks and leaves, especially with the season’s hot dry air. USGS water gauge. This crucial monitoring tool was damaged by the fire and five 24-hour periods over 6 days were lost. USGS had already sent a crew to repair it when they received inquiries – quick action! Funding. 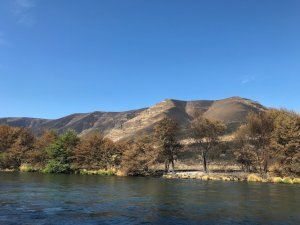 We are all paying $10 per boater-pass that does not go to the Deschutes, and we can be sure agency budgets are being eaten up by fire control and suppression efforts. We need every Deschutes dollar we can get to stay in the watershed and fund facility repair and natural resource restoration! Angling and Water Temperatures. It is hot out there folks! Hopefully PGE will turn some knobs and send more water and colder water downstream. Seems like everything would benefit from that. As for angling, the afternoon temperatures are reaching dangerous levels. Do you have it in you to stop angling when the water hits 68F? The studies show the effects of warm water on steelhead and salmon in terms of mortality upon release. We know that the wild fish are the best biters on the Deschutes, so trying to catch a hatchery keeper on these hot afternoons and evenings will invariably set you up for an encounter with a wild steelhead. When the water hits 68F, just say No. If you must fish (for religious reasons of course), cut the points off your flies or your lures and fish for the grab – that is actually the very best part, right?